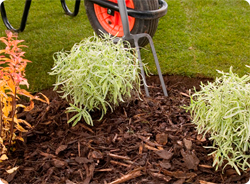 Mulch, at its simplest, is a layer of material around the base of plants, which may be either organic or inorganic. In this context, organic is not used in the Soil Association sense to mean ‘without chemicals’, it simply means made of carbon-based material such as wood chip, bark chippings or compost. Inorganic, then, means made from stone, glass or anything else not carbon-based. A mulch can be as simple as a layer of pretty stones or glass pebbles on the top of a flower pot, around the base of the plant it contains, or as complicated as covering all the exposed ground around all the shrubs in your garden with bark chippings. Mulching has all kinds of benefits, depending on where you do it and with what material. It can be very decorative, as when you cover the top of pots with glass pebbles, or put slate chips around plants near a patio. Inorganic mulches also help prevent water loss through evaporation from the surface of the soil. Mulching with organic material has multiple benefits. A thick mulch of compost or bark chippings will protect tender plants from frost over winter. It will also help retain water and suppress weed growth over the summer, as well as providing nutrients for the plants as the mulch rots down over one or two seasons. It’s best to renew the mulch every year, in spring, to ensure that you keep the weed-suppressing and water-retaining benefits. Some mulches also deter pests: for instance, many gardeners swear by a bed of gravel around hostas to keep slugs and snails away. Again, this really depends on what effect you want to achieve, as well as your budget. If you are using an inorganic mulch, aiming for a decorative and mildly water-retaining effect, you can keep it to a thin layer. However, a mulch of bark chippings or compost really needs to be quite thick to be effective. Experiments suggest that bark chippings are most effective at retaining water and deterring weeds when they are about 5cm deep, which is actually a pretty thick layer. If you need to cover a large area, you’re probably best buying in bulk from bark suppliers, who can offen deliver next day. This will save you buying 20 bags from your local garden centre. Use our bark calculator if you not sure how much bark you need to mulch an area. You can use compost, bark chippings or even something sold as ‘play bark’, which is simply bark chippings prepared to a particular standard. Natural products usually guarantee that there are no chemicals so that you can be absolutely confident that there is nothing in it to hurt children and pets playing in the garden. Wood chip is not ideal as a mulch, as it takes longer to break down, and so doesn’t provide the same nutritional benefits so quickly.